Our 1967 VW splitscreen camper van, with a turret top and classic roof rack. She was born in Germany but spent most of her life in sunny California before returning to Europe. 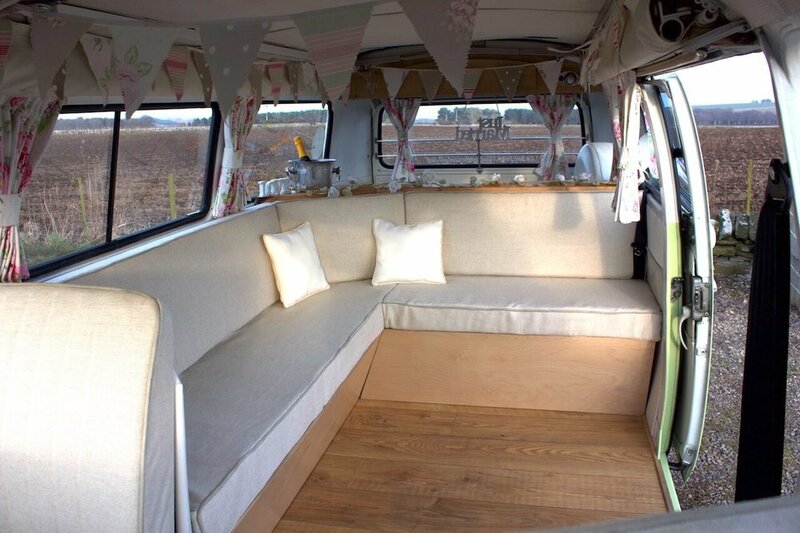 This beautiful blue and white van has a completely tailor made interior ready to transport you to your wedding. 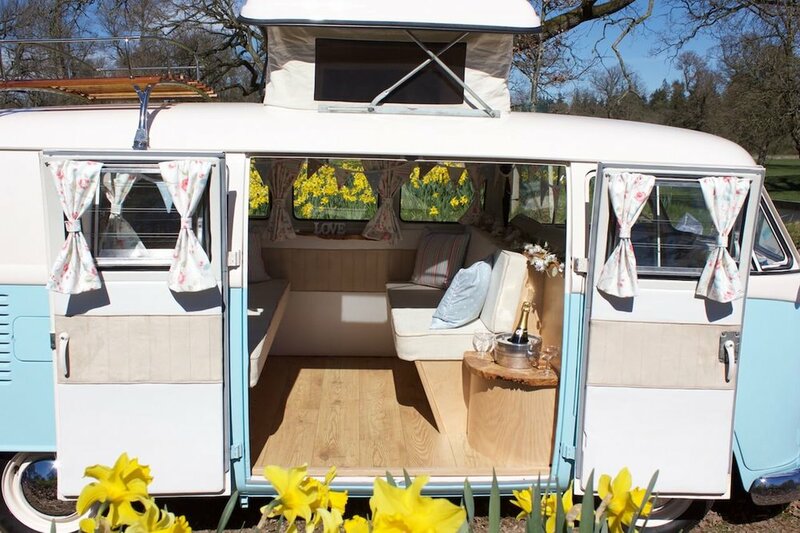 Our camper has hand crafted, Scottish burr oak side tables & champagne bar with oak flooring and cream upholstery as well as optional designer fabric floral curtains with coordinating cushions in spots & stripes. A vintage wedding car with a difference that seats up to 6 passengers and is the perfect wedding photo prop. 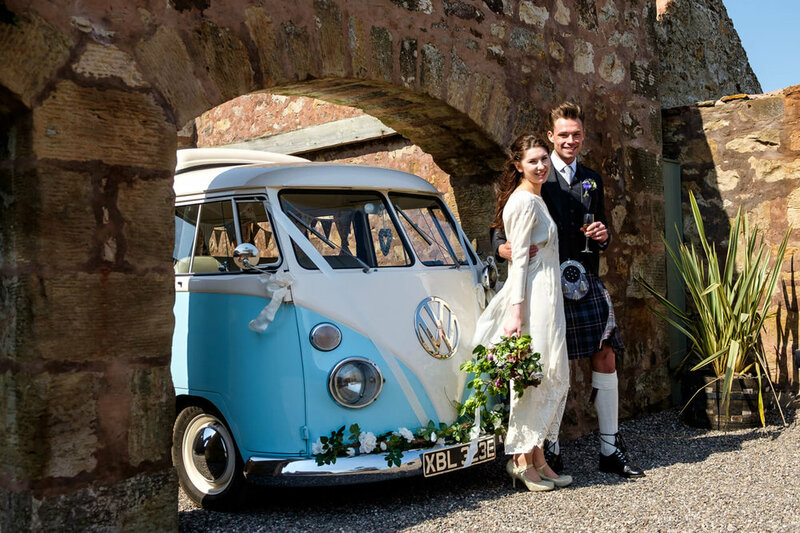 Contact us to book Lickety Split as your VW camper wedding car. 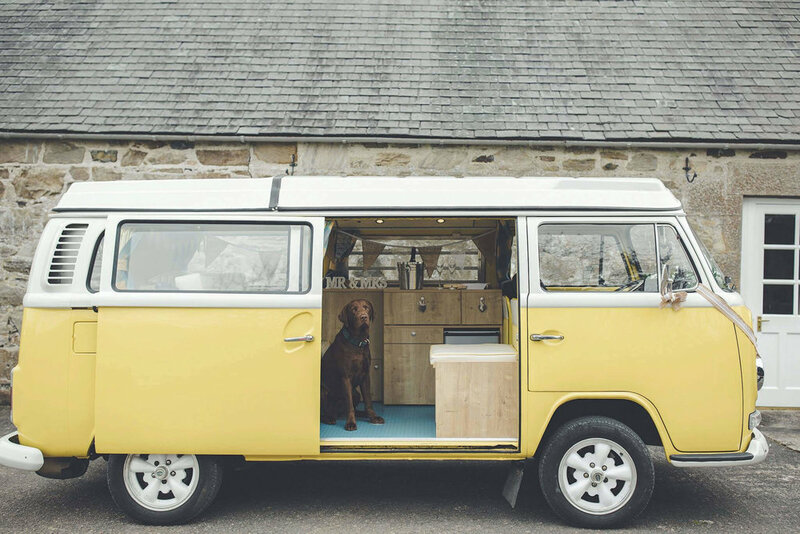 Our classic 1975 VW bay window Devon pop top camper van. The baby of the fleet; her paintwork in white and pastel green combined with her cream upholstery make her a very cool customer. Hand crafted oak shelving to hold a champagne bucket together with a shabby chic soft furnishing flourish, 'Moomin' VW is a bright & luxurious wedding car option. This wedding camper seats up to 6 passengers and seating at right angles leaves plenty of legroom; the rotating front passenger seat also makes for great photos. Make a memorable entrance to your wedding day. 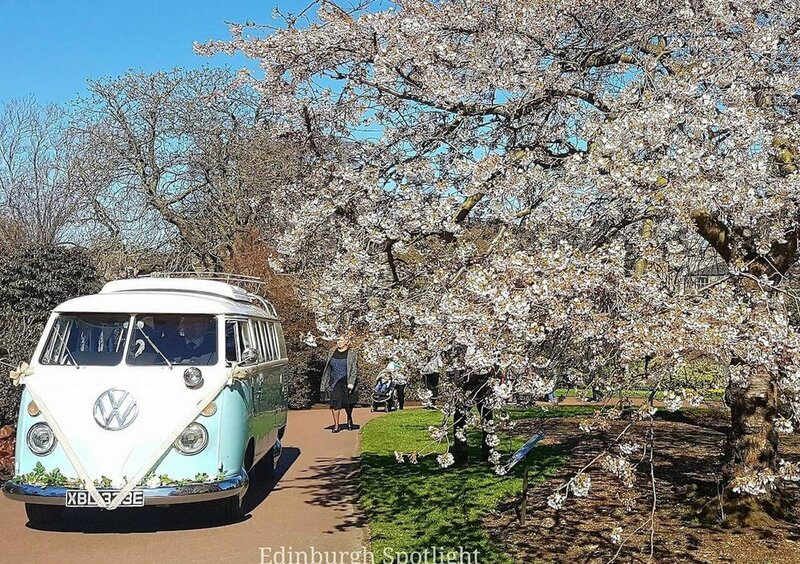 Contact us to book Moomin as your VW camper wedding car. Our classic 1972 VW bay window Westfalia pop top campervan. Sunshine yellow over pastel white she is summer on wheels & also seats up to 6 passengers. Her yellow paint work match perfectly with bright, spring weddings but is equally suited to summer sunflowers and autumn leaf colours too. A spacious interior, new for 2019, in cream & primrose yellow with spotty curtains make ‘Little Miss Sunshine’ VW bright & cheerful both inside & out. New photos up soon, please check out our Facebook page in the meantime to follow her makeover. A wedding car that brings instant smiles to faces & a wonderful splash of colour to photos. Contact us to book Little Miss Sunshine as your VW camper wedding car. Our 1934 Triumph Gloria Tourer, the perfect vintage wedding car and by far the respected elder of the fleet having been in our family for over 40 years. With a stunning restoration that has brought her back to her former magnificence, Gloria is a regular at the vintage vehicle Extravaganza at Glamis Castle each year. ‘Gloria’ will seat 3 passengers, 2 in the back and 1 in the front. The soft top hood can be put down and up for photos. This maroon and cream wedding car makes the perfect entrance to your special day. Contact us to book Gloria as your wedding car!